Is Russia set to build highly dangerous combat robots? (NationalSecurity.news) It sounds like something straight out of a science fiction movie, but the reality is, robots will eventually make their way onto future battlefields, and Russia could be leading the way, according to a recent post in the Military-Industrial Courier, a Russian defense trade newspaper. As noted by The National Interest, while the article led with a realistic scenario in which “combat” robots might be utilized on a relatively large scale, the concept nevertheless has a few problems. “To attack fortified defenses and minimize human and material losses, you must create a robot company, in addition to tanks and infantry fighting vehicles and remote-controlled military robots and assault machines,” Leonid Orlenko, a professor at Moscow State University, wrote. He went on to present the idea as a solution to a real military problem, as modern armies have written entire textbooks on how to breach fortified defenses, the scenario he uses to introduce his combat robot concept. It’s one of the most dangerous of battlefield operations, and it’s also an area he believes Russian-built combat robots could exploit successfully. Russia has little chance of moving ahead of the United States, first, and China, second, in drone technology, following decades of neglect and technical limitations following the collapse of the Soviet Union. Russian drones are relatively crude and are limited to light surveillance duties. Also, Russian aircraft have mostly been over-engineered and are heavy, which is counter to the engineering philosophy guiding the development of drones and their miniaturized, lightweight components, The National Interest reported. — The first wave is comprised of a half-dozen robotic armored engineer vehicles, which stop just short of enemy defenses. They are there to clear mines and conduct reconnaissance. — The second wave is launched with rocket, artillery and mortar fire, followed by three human-manned tanks and three robotic “assault machines” that attack. 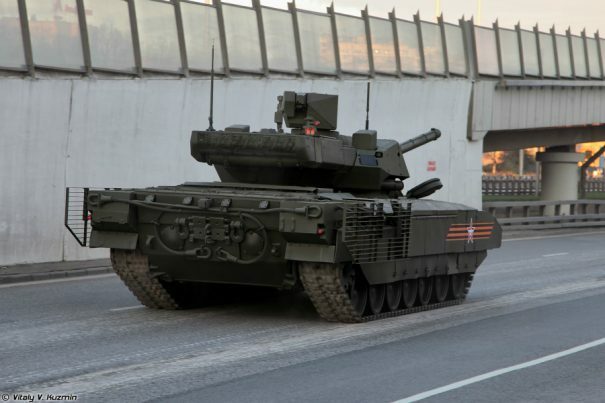 The robotic platforms could be built on existing T-72, T-80, T-90 and Armata tank platforms, but armed with larger guns, guided missiles and 30 mm cannons, to shoot into hard-to-reach places. — Once the second wave suppresses defenses, a third wave of seven infantry fighting vehicles like Russian BMPs advances and attacks under cover of the preceding wave; infantry dismount and complete the attack. “Orlenko argues ground combat robots would reduce the total number of soldiers needed to assault a defense. Reducing manpower is a similar rationale behind the Pentagon’s own tests, though U.S. Army experiments have struggled with robots needing too many human operators,” The National Interest reported. Check out AlternativeNews.com for more breaking news on important issues ignored by the mainstream media.